CamelCrusher is an all-around ‘coloring’ multi-effect plugin that offers a combination of effects including distortion, compression, and filtering. While this is a free edition of Camel Audio’s once-paid plugin CamelPhat, it’s a must-have in your plugin collection! Ever since Camel Crusher was released, it has been a flagship in music production. Camel Audio displays a simple, yet effective plugin layout that allows you to easily achieve the sound you’re looking for. And their quality didn’t go unnoticed. Camel Audio was bought out by one of the largest companies in the world, Apple, in 2015. This definitely shows you how powerful this plugin is. They created Camel Crusher to allow you to easily distort your sub or even add some crunch to your synths all while the filter and compression keep it clean and under control. And like their paid version of the plugin, CamelPhat, it presents a collection of amazing presets that allow you to easily find your sound. It also features a button that will provide a randomly generated effect . This will allow you to consistently achieve different results, so that you can keep your style fresh. If you’re looking to beef up your sub, add style to your synths, or general distortion, this plugin may be for you. With this overview, you should be able to find out whether this plugin suits your needs. While the pros weigh out the cons, the idea of this plugin being discontinued may scare some people away. However, Camel Audio was bought, because they made great and high-quality plugins that are still usable today. So it may stick around for longer than we think. With Camel Crusher, you have an endless amount of possibilities, but we’ll show you exactly what there is to do with each feature. When you first open up Camel Crusher, you’ll notice two features: the patch selector and a ‘randomize’ button. This feature allows you to choose between a variety of different effects that are pre-made, allowing you to explore different styles. Additionally, the randomize button will randomize the values of the modules you have turned on.You also have the option to turn the module off, so the randomize button will not affect specific knobs. This is extremely useful if you want to play around with different styles and keep a fresh sound. Under the patch selector and randomize button there are four modules: distortion, filter, compression, and master. Each of these modules play a crucial role in the plugin, so we’ll talk about each of them. The distortion module offers two knobs, ‘TUBE’ and ‘MECH’. If you’re looking for an analog sound, the tube knob is great for that. If you’re looking for a more dirty and mechanical sound, the mech knob will be your best friend. To smooth out any harsh sounds, you can use the built-in low-pass filter that Came lCrusher offers. It displays two knobs, ‘CUTOFF’ and ‘RES’. The cutoff knob will remove high frequencies as you turn it up, while the resonance will boost the frequencies where the cutoff point is set. Unlike the previous modules, the compressor offers one knob and one button. This compressor is extremely powerful. The ‘AMOUNT’ knob simple applies how much compression you chose to your sound while the ‘PHAT MODE’ button will apply a rough effect to your compression. 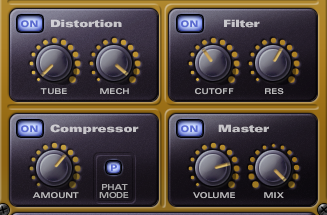 The more compression you use, the more you will hear the ‘PHAT MODE’ effect in your sounds. The master section offers two knobs as well, with ‘VOLUME’ and ‘MIX. The volume knob simply effects the overall output and the mix knob effects how much of the effect is applied, similar to a dry/wet knob. Unfortunately, when it comes to Camel Audio, you can’t have more. While Camel Audio was around, there was an extended version of Camel Crusher called CamelPhat. But since Camel Audio was purchased by Apple in 2015, you can’t purchase CamelPhat anymore, and you’re stuck with Camel Crusher. However, if you do want more, you can create the effects that are within Came Crusher in other plugins that have distortion, filter, and compression modules. Luckily these are popular effects, so most multi-effect plugins include these. You can apply the effects of Camel Crusher to virtually anything. We’ve seen them mostly be applied to 808’s, drums, guitars, vocals, and synths. However, the use of this plugin is endless. For example, you could even apply this method when you want a crunchy synth lead. Just throw some mech distortion on there, and you’re pretty much good to go! And sometimes having the original sound underneath or above the distorted effect allows it to stay in the mix but still have some flavor to it. This is why distortion is found on a huge variety of sounds that you wouldn’t have even guessed. You can use this plugin pretty much anywhere you desire. Basic distortion and filter FX can be achieved by any producer regardless of skill level. It’s one of the most popular effects next to reverb or delay. Usually, this is one of many tools learned when first starting production. It’s even fair to say that with the patches and randomize button included, you could get by using this plugin without knowing how to operate each effect on its own. Simply moving the knobs will allow you to sonically adjust what it’s doing. The most advanced part of this plugin wouldn’t be within the plugin itself, but how to use it in a productive manner. For example, we explained earlier how you can split your channel into two different tracks and layer them accordingly. This is something an intermediate producer would understand how to do on their own if not taught by someone else. Because of this, we would say the knowledge behind this plugin is a beginners course, but it’s powerful enough to be used for professional mixing as well. Camel Crusher is assuredly a must-have when you’re looking to build your plugin collection. The idea of such a powerful plugin being free is the first feature that sold us. Proper distortion control is huge and with this plugin and the included patches, you can balance it easily. While some stock plugins may offer the same, this is a great alternative if you’re looking for something simple, straight to the point, and fun to play with. If you’re not sure what all of the buttons on your huge distortion, compression, and filter plugin do, then this plugin is perfect for you. If you want something fresh, unique, and lightweight on your CPU, this plugin may also be a great option. Overall, this is a great output and one that you should definitely try since it’s free.